Not only are these mashed potatoes super creamy, but they have real flavor. 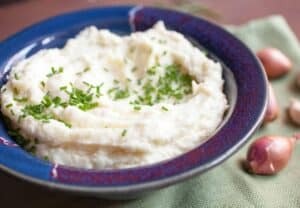 Roasted garlic and shallot mixes perfectly and makes for some of the best mashed you’ll find! Cut the tip off a garlic head and cut the ends off of shallots. Drizzle all with olive oil and sprinkle with salt and pepper. Wrap in foil and roast at 350 degrees For 35-40 minutes. Meanwhile, peel and cube Yukon potatoes. I shoot for about 1 1/2-2 inch potato cubes. Boil in lightly salted water until the potatoes are very tender, 15-20 minutes. Drain potatoes and return to hot pan. Mash with a potato masher or large fork until they potatoes are mostly mashed. You can also run the potatoes through a ricer if you have one or even grate them with a box grater. When garlic and shallot or roasted, peel and either finely chop or pulse in a food processor to form a paste. Add butter, sour cream, and garlic/shallot paste to the potatoes. Continue to mash until the potatoes are very creamy. Optionally, you can add potatoes to a stand mixer and whip with a paddle attachment until very creamy. If potatoes are dry, you can some warm milk by 1/3-1/2 cup until very creamy. Season mashed potatoes with salt and pepper to taste and serve while warm. This delicious recipe was brought to you by Macheesmo. Read the full post at https://wp.me/pkSYO-fqy.